November is my very favorite time to hunt, unfortunately we lose a day to deer rifle season. The couple meets prior to today had been cold and windy with some small, early runs on fox, some runs on coyote, losing when game crossed open fields. 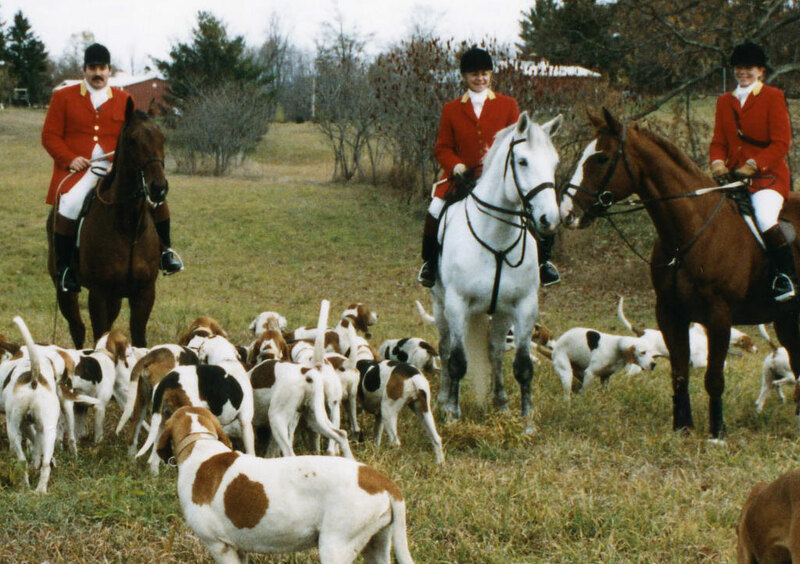 After Saturday off for Opening Day Rifle Season, we started from the Kennels leaving at 9:30 after a very cold night and morning–it was 20F when I went out to tack up my horse–a promise of more moderate temperatures forecast, hounds were cast to east. I went to my appointed station overlooking the valley finding a sunny hillside to soak in the rays. Hounds picked up fairly quickly and ran fox to the east and then south and around again and south along the wooded slopes above the state road. Huntsman, Thomas, collected hounds and carried them to the west for crossing dirt road to new cover. The pack’s restlessness was evident. I scurried westward to my new position, on the way I hear ‘hounds are caste’ and Jay, riding with road whip, Linda, tell us ‘I think I saw something’. Hounds pick up–coyote–in swamp, after a time of sorting things out, open and run for the most part south and to the west of the hillside. As that woods peters out to large hay and corn fields the quarry headed south and west, also toward the state road. While in the corn coyote turned to the north and made a loop now headed west to the ‘green gate’ on the next dirt road, a favorite crossing for them. I followed the pack, all on and open, through woods to heifer pasture, west, then north, into another wooded wet area. They crossed an abandoned road, still north to another swamp where they came west, then returning to east side of swamp. Then the music stood still. At Bay? Yes, but how to get to them? Whips Stephanie and Stefani picked their way to the cacophony of voices, coyote under a tree. This was repeated again and again as Tommy called hounds to him, quarry skedaddled and hounds began their pursuit anew. In the end, hounds were collected, we hacked home to covered dish at the Kennels, a bunch of happy hunters were we.